While there is still time for the 2016 BMW 7-Series to be unveiled to the general public, Youtube channel TouriClips caught the test mule being thrashed around the Nurburgring in full camo. The new 7-series is going to be an all new design and will be built keeping lighter materials in mind. While the new car is still heavily camouflaged, some interesting design features are evident. The overall body shell looks much sporty that the current model.While still carrying the traditional ‘Hofmeister Kink’ at the C-Pillars the roofline appears slopes more elegantly to integrate with the boot of the car. The new 7-series will incorporate newer construction technologies as its chassis will be made in much lighter steel, aluminium and carbon fibre. The new model is anticipated to be lighter by as much as 500kgs compared to the current generation 7-Series and have a much more ‘flexible’ chassis design. This would compliment to its sport attribute as comparing to its segment rivals the Audi A8, Jaguar XJ and the immensely impressive new Mercedes-Benz S-Class. 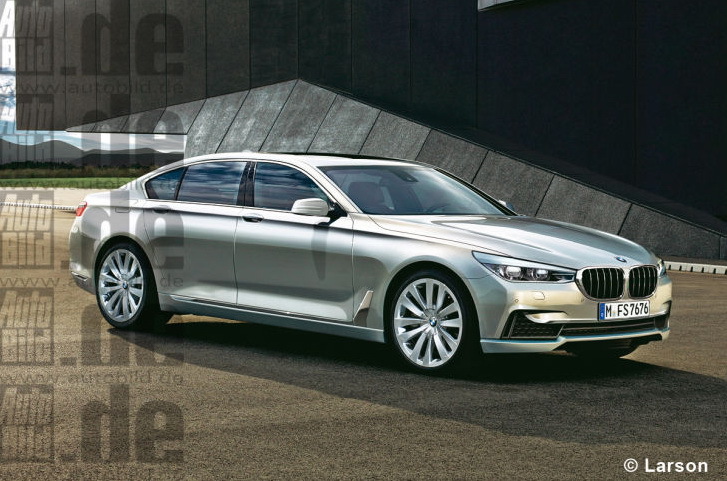 BMW have a massive challenge on their hands with the new 7-Series. They have to get the recipe correct as their competitors have upped the ante tenfolds. In terms of features and technologies incorporated in the current generation full-size luxury sedans, Mercedes-Benz leads the way with advance features such as Magic Body Control and an all-LED car while Audi takes home the trumpet with its new Matrix headlight technology and have showcased their GPS controlled Automatic parking system.